It’s been a knackering couple of weeks running up towards Christmas. Partly that’s work, which has had a special frenzy about it for a while. Without going into specifics, the organisation is being forcibly separated into public and potentially private sectors along lines drawn by morons. The plans for it are terrifyingly inept and poorly thought out. And that’s just the high level view. When you get down to actual details you find a horrifying blend of ignorance, naivete, arbitrary decisions and absence of information. Some species of catastrophe is inevitable. Improv and home have been much more fun, but have torn us out of doors most evenings. There have been a pleasing number of evenings spent drinking and chatting with close friends; it is a goodness. We’ve also finally got a new television (thanks Mum & Mike!) so we can start catching up on a month’s recorded TV and Christmas films. Not much, other than Christmas really… I have great plans for Lego, reading and drinking the cupboard full of beer I have acquired. We shall see select humans, hug them and send them on their way again. I intend to publish a series of Christmas beer drinking reviews for your entertainment and my inebriation. Poem: Find Me – a little bleaker than I’d intended, and unintentionally triggering a mental run off. I was really hoping to get straight into lie ins immediately, but I had to bound out of bed on Saturday at abnormal o’clock to ravage Derby with the Furthest From The Sea gang for Knickerbocker Glorious. Marvellous chaps and musical folks all round. I find my Saturdays spent with Jamie, Dave and Josh especially fun. They’re an excellent crew and we seem to have clicked rather nicely. We’ve had some fascinating gigs this year. Often it’s dealing with complete arseholes and whining randoms that makes it so special. I shall never forget the war of the badgers, the drunks and the hat people. Last week we had a nice range of people I had not previously met on stage, including the rather lovely swing Christmas singing of Rose Devine. To get the balance just right we also had Dwane Reads (a very fun on stage partner) and local comic and poet Flames Snakely. We had some fine banter and story, poetry and song invention on the fly. I also just noticed that I’m on the Furthest From The Sea Artist page – how lovely, but then that’s the sort of folks they are. Next year is going to be immensely cool and exciting – Derby’s going to be the place for joy. 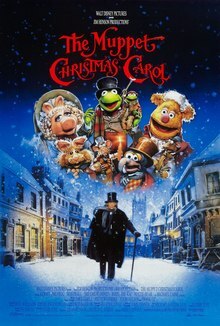 On Sunday morning, a time one might reasonably expect to be blissfully unconscious, saw us rise at a Satanic hour to see the Muppets strut their Dickens at Cineworld. Incredibly we also hauled two good friends out to see it as well. I was pre-verbal until after the film but I was able to snort and laugh throughout. It’s a surprisingly resilient film in which I still find new amusements. I very much enjoyed Michael Caine‘s incredible awkwardness when singing – it reminds me of my own pain when trying to loosen up enough to sing myself. I’d forgotten how much I detest Robin in his needlessly over the top portrayal of Tiny Tim, but also how weird Gonzo/Charles’ proclamation that “Tiny Tim didn’t die” is. It certainly made us laugh… to the perplexity of the kids behind us. Other brilliant moments include the watermelons being stolen at the beginning, ice-skating penguins and the lobsters in the closing scene.